Christine Lapperriere, the author of Too Busy to Be Happy, knows that lot of us are just so busy that we don’t get tot truly enjoy our lives and just be happy. Christine asks, “What do you do when you can’t handle the life you’ve created and you don’t feel like you have time to catch up?” From the outside, your life looks successful but inside, you’re overwhelmed and exhausted. That’s what we’re talking to Christine about today, her theory that everyone has a finite amount of emotional real estate to process decisions, change, drama, baggage, and relationships. It’s also her personal story that will teach you how to reclaim and boost your energy and work-life wisdom. Christine Laperriere: I was working in consulting, and about 12 years ago, I got promoted very quickly. I was very ambitious, very hardworking. I moved from senior consultant to senior manager in a pretty short period of time. All of a sudden I was juggling two teams, one in Toronto, one in New Jersey. I was on a plane every Monday morning, commuting back Thursday nights, juggling these two teams. I’d been through a recent breakup, so I didn’t have a lot on my plate besides work but I was putting all my energy into really trying to prove myself in this newly promoted position, and as time went on, I started to notice that I was working and working and just genuinely not very happy. As time continued on, I started to struggle to breathe a little bit. I was having shortness of breath and sometimes I would notice that no matter what I did, I couldn’t actually catch my breath. I started into doctor’s appointments and chest X-rays and sleep apnea tests and allergy tests. While I’m juggling these doctor’s appointments, one of my projects is starting to go a bit south, and I keep waking up in the morning just wishing I could call in sick because I’m just so tired. At the end of the day, there was no gameplay of when I would actually stop taking Ativan. I took the prescription home, set it on the desk, and I thought to myself, “I can’t start taking Ativan just to keep up with my life. That’s not a good enough reason to do this.” As the weeks wore on, I remember waking up one day, and I couldn’t put my mascara on in the morning because my eyes welled up with tears at just the thought of another day. I just couldn’t seem to get excited about getting out of bed. It can’t just be a long weekend, It can’t be a couple of weeks’ vacation. I think I need to get sick. Maybe if I got sick, I could take a long break like a real long break and people would give me permission and instead of judging me for being a failure, they would feel bad for me. It would be different then if I just admitted that I couldn’t handle it and had to walk away. Thankfully, something in my brain said, “This is really bad.” When you start to fantasize about getting sick. Even the fact that at one point I remember thinking cancer, you know? That cancer would be a way out from keeping up with my busy life. I just realized that enough was enough and something had to stop. Rae Williams: What was the first thing that you did to take action and what is something that listeners and readers of your book can do to take action this week if that’s something that they’re feeling too? What I think other people can take away from that is the fact that the priority of my sanity became job one. I put a hard boundary in place for me to actually get the break that I needed so that I could reenergize and heal and actually move forward at a much more powerful way. Rae Williams: What exactly is emotional real estate? Christine Laperriere: Good question. I like to explain it as if you were to picture your brain as a house, and the front yard of the house is this thing I call emotional real estate. It’s this fixed piece of property that we have to manage thoughts about change, thoughts about decision-making, thoughts about relationships. We’re thinking about the past sometimes, the future, the present moment, things we’re trying to do, we’re also trying to remember things and we’re trying to process things that have happened and processed decisions that are going to happen next. One of the most important things that I want people to know is that that fixed amount of emotional real estate means that we have to start to budget that space, just the same way that we budget time and money. Leading back to the story that I just told, the part that I didn’t understand at that moment was that I didn’t have enough emotional real estate to hold on to all the negativity and the thoughts and the change and the travel and the adjustments and learning new skills. I didn’t have enough bandwidth to actually manage all of that at the time, which is ultimately what led to my burnout. Rae Williams: How often do you see this burnout in your environment? This is the life that we’re all juggling, and I think the truth is that so many people I know really feel like just to keep up with their day to day life, they’re using up all of that space that they have, all that emotional real estate is currently being spoken for, and that’s where they’re struggling to become present. Rae Williams: Where do we start? Where does one take action? It’s easy for us to be very prescriptive, but what my argument in the book is that once you have a model to grow the self-awareness that you need to manage that emotional real estate and once you become really aware of it, it’s almost as if when you think of getting into a vehicle. You have a dashboard and you have gauges. You know when the gas tank is low and you know when the oil temperature is high. You can see all these gauges so you can adjust your decisions based off of that. So it’s really easy to know the gas tank is low, I’m going to have to plan a stop coming soon. My argument is to grow the awareness first by understanding these concepts and understanding these tools to build it. My argument is that we should be starting to build conversations with our friends and our communities around what our work-life wisdom feels like. Honoring the fact that work life wisdom feels very individual for each of us. What uses up a lot of energy for me or eats up a lot of emotional real estate for me might be very different than what eats up a lot of emotional real estate for you. We need to become aware for those things so that we can start to make some different decisions. Rae Williams: What are some of the other things that people should look out for that can happen if they’re not properly allocating that emotional real estate? 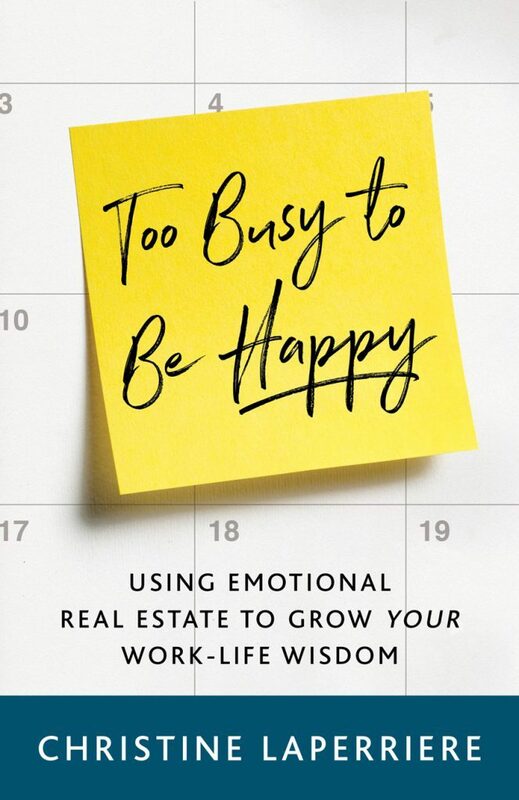 Christine Laperriere: I named the book Too Busy to Be Happy because it’s ultimately that lack of feeling of happiness or feeling disconnected from life or feeling like it’s happening faster than you can really keep up with. I think we’ve got people that have health issues. Lots of people I know go to the doctor to have things diagnosed and the doctor is saying that this health issue is a stress-related health issue. Insomnia, heartburn, you know? So many times, like doctors are sending people home saying “Yeah, you’re under a lot of stress,” that’s the answer. They can‘t seem to tell us how we can learn tools to not live like that anymore. Rae Williams: We don’t want to give the whole book away, but what is the biggest tool that you need people to know? Christine Laperriere: The one that I love and I was inspired by someone else who did a morning routine that was very short, it was just a couple of minutes long. I picked up this practice and I started to build my own practice around it. So in the book and on my website, you’ll be able to download it, it’s called the seven-minute morning. asked clients to start testing it, and almost immediately, they were saying wow, this really is making a big difference. And the seven-minute morning is really simple. I take out my phone and I actually set my timer on one minute increments. I know that sounds very OCD, but it’s so that we can keep this practice nice and short. So the very first minute, close your eyes, get really quiet and just allow one minute of silence to pass. It’s amazing how it feels really long and you’re waiting for that timer to buzz, but just noticing that it’s time for you to get really quiet. Second minute, moments to savor. I love to encourage clients to go back in the last 24 hours of your day and just pick out the moments that you really savored or the moments that you’d like to relive for a second. It can be as simple as, for me, watching my daughter jump on her bed. She’s so joyful and so happy in that moment and so full of life. I could think of that little moment where it was one worth savoring. Or it could be that really delicious meal you had at a restaurant and it was the first bite of that dish that was just so good that you’re like, “I can’t wait for one more meal like that.” The moments to savor is just reflecting on in the last 24 hours, what are those highlights? The third minute, I do an emotional real estate check. What is currently using up emotional real estate right now for me? I noticed that I could wake up in the middle of the night and I’d be thinking to myself, “Oh no, I’ve got that author interview tomorrow.” That’s using up emotional real estate for me right now. It’s making a quick list of the things that are using up emotional real estate for me so that I can pay attention to what’s on my radar for that moment. In the fourth moment, I like to pick empowering beliefs that I feel like I need for the day. It might be saying, “Today, my empowering belief is going to be that what I have to share today is important,” you know? I might be nervous about talking or speaking at an engagement and I might decide that the empowering beliefs I need to remind myself of today is that what I have to share is important. What would that meeting look like if it went incredibly well? If I came home tonight and I hung out with my husband for an hour and a half, what would that look like? Would we hang out and actually talk or would we just sit on our phones and check out what a good day would be when we actually hung out as friends? Minute six would be taking action. Again, anything that’s no that emotional real estate what things do I need to take some action on and I also like to challenge people, is there anything that you need to let go of? Sometimes just, we’re dragging around some baggage and maybe it’s just the conscious awareness that it’s time to let go of something. And then the seventh minute is just a fun one. I call it brain candy, but it could be you know, putting on a favorite song, reading a book, reading a blog. Just a minute or two of something that’s kind of intellectually stimulating. Get your wheels turning for the day just to get you a little bit fired up for the hours ahead. Rae Williams: I’m definitely giving that a try this week. I think a lot of people have issues with taking that time for themselves. I feel like that’s such a great way to start you know? The seven minutes. Christine Laperriere: Well, I had to come up with something that I could do myself. I have this belief that I can’t ask anybody else to do something that I can’t keep my commitment to myself. When I started practicing these short morning routines, it dawned on me that it doesn’t take much to rewire your thinking for the day. I understand all of those concerns that people have. I was trying to think of what do we have time for? I’ve learned how to do it on the subway when I’m headed downtown. I know how to do it, sometimes even just as simply as if I am driving to a meeting. It is easy for me to premeditate and just walk through the ideas. And just replaying some of those in my mind and then the next 24 hours I am on the hunt for those moments to savor again because I know I’ve got the commitment the next day to thinking about them. Rae Williams: Along those same lines, what are some of your favorite success stories and stories of just how the lessons in your book have affected other people’s lives for the better? I just said, “Let’s set the meeting aside—walk back through what the last six weeks.” She started to talk about the fact that one of her children had a health issue and she had been in and out of the hospital with her child. Right off the bat she is missing all this time from work. She is juggling her job, she is in a leadership position so she had a big team and she’s juggling her job remote from the hospital while the doctors are trying to diagnose her child. I don’t know about the rest of you, but that right there would use up a lot of emotional real estate. It just made her feel even more guilty about being out of the office. But meanwhile, feeling like she didn’t have what it takes to manage her leadership role while she also was being a mother to a child who had a real illness. So here are these things that are all happening, and then she walks into this meeting and had an emotional response. So what we really started talking about was the fact that her emotional real estate was fully used up. And we started talking a lot about how, first of all, forgiveness for the fact that that response in the meeting was not a response to her being weak. I would actually argue on the other side that she was being incredibly strong but there is a moment in time where we can’t bear the weight of everything anymore. That’s actually what happened in that meeting is that she couldn’t bear the weight of one additional idea or thought to add to her emotional real estate. And from that, we had a lot of conversation around how during this time while she was juggling her child and juggling this leadership role, we started talking to her about ways that she could re-energize or do things that gave back emotional real estate so that she could start to manage her stress through this really difficult time. So she is one of my favorite stories just because it was so helpful for her and she since went on to be really successful and very busy and very happy. Rae Williams: What are some other ways that people can identify that they are in danger and this is a step that they need to take? Christine Laperriere: I think ultimately if you don’t feel like you can keep up very well or you’re feeling really exhausted at times. There is no doubt that tools like this would help. My thought is instead of waiting until we have burnout, instead of waiting until you can’t breathe or you are fantasizing about getting sick so you can take a break, why don’t we start to educate ourselves while right now when things feel good or when we are not overwhelmed and overworked and dropping like flies at the end of the day? Why don’t we educate ourselves that we actually have a really good mental framework for managing stress and just get out in front of it? Because I don’t believe prescriptions for Ativan are the solution to stress. I really think educating all of us who are busy and have a lot on our plate, why don’t we educate ourselves on how to get out in front of this? Rae Williams: How would you recommend having that conversation with a friend? Christine Laperriere: Well it is a great question because I actually have a coaching component that goes with this where people can actually learn some coaching tools with how to use this with friends or family members. One of the things that would encourage those is when you are talking to another person and they feel stressed and overwhelmed, one of the first things we can do is start to explain the idea of emotional real estate. Just ask them to talk about what are the biggest things that they are choosing to use their emotional real estate on, and that wording is really important. You have a fixed amount, and if you start to realize that you are empowered to spend it just the way you spend time and money on the things that you feel are important, it actually helps people realize they are spending emotional real estate on things that they don’t actually want to. They will start telling you about it, and as you unravel it, ask some questions about how they’re choosing to allocate emotional energy to that, it can really be an aha moment for them sometimes that they are empowered to decide if they want to budget emotional real estate for that issue or not. I think I have seen a lot of people have an aha moment that you know, making my mother in law happy at Christmas time is no longer going to be something I use up emotional real estate on. The end. There’s bigger things. Sometimes we have health issues and we know that we have to use emotional real estate to process those, but we are going to make sure that we don’t use it wastefully on things that don’t matter. Rae Williams: Okay, if you could issue a challenge to our listeners and your readers, what would that challenge be? Christine Laperriere: So first my challenge would be 21 days, do the seven minute routine. You would be able to get it at my website, which is myworklifewisdom.com and just try it every single day for 21 days. So 21 days is long enough that you can actually build a habit. I would say that’s my first challenge but if you don’t even want to do that I would say prioritize doing something very purposefully that’s unproductive that gives you back emotional real estate. So booking a lunch with a friend that you haven’t seen for a long time or going for walk with your dog, whatever that is but paying attention to what things give you back emotional real estate and being very intentional about booking that time guilt free. Because that time is helping to energize you so that you can manage everything else. Rae Williams: Nice. And is there anything about the book or anything else that we haven’t talked about that you definitely want people to know? 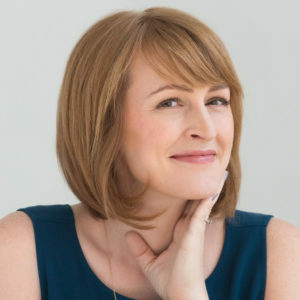 Christine Laperriere: We talked in the book about all the different types of things that use up emotional real estate and being really mindful of that, but I think I want to make sure that everybody hears that paying attention to what gives back emotional real estate is also an incredibly important part of this de-cluttering process. I’ve had so many people come back and say that just that act of seven minutes gave them back so much emotional real estate that they felt like they were energized for their day. The act of that helping them de-clutter their mind and get really focused that 10 minutes felt really energizing and gave them back emotional real estate. Some people get a lot of emotional real estate back from exercise, other people get it back from knitting and so we have to be able to recognize that everybody gets emotional real estate back from very different things, and I would encourage people to try to find out what those things are for you specifically instead of trying to use kind of the cookie cutter approach that we tell everybody to do. Rae Williams: Nice and just out of curiosity, what’s your favorite way to get your emotional real estate back? Christine Laperriere: I am a mom of a one year old and a three year old and what I’ve had to become really aware of is these beautiful little moments that happen usually in the middle of a lot of chaos, where I just become incredibly present with the beauty of these little people right now. So that is really what’s happening in my life but I feel like my daughter has these moments where she’s just so precious and so cute and my son is just learning how to walk. Just the simple thing of him walking, you know, he takes five steps and we all clap and he turns around and looks and he claps. I really take that two minutes and I savor it so much. I try to lock it into my memory banks and enjoy every minute of it because I don’t have the ability to run out the door and go have dinner at night with a friend all the time just the way that my life is. I am trying to find those moments to savor right in my home while I am in the middle of doing all the things that I am responsible for as a mom. Rae Williams: How can our listener and how can your readers contact you? Christine Laperriere: I have an Instagram page, @myworklifewisdom. I also have a website, myworklifewisdom.com. I am on LinkedIn under Christine Laperriere, and I am happy to link with people who reach out. I’ve always been really open to connecting and meeting new people and then I am the owner and president of Leader in Motion. So you can always reach out to me through the Leader in Motion webpage. Get Christine’s new book Too Busy to Be Happy on Amazon. Find out more at MyWorkLifeWisdom.